Heroes don’t necessarily have to be big and strong – or even human – to make a difference in the lives of the people they save. This is the ultimate lesson that young Kayla and Landon learn when their grandfather takes them to the seaport, and the children find themselves face to face with a most unusual hero. 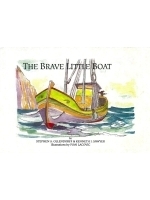 The Brave Little Boat is a story about a seemingly small, insignificant boat that played a heroic role in saving the lives of over 300 Danish Jews during World War II. I just read the book and Im deeply moved by this short and brilliant text. Its different from all the other stories we grew up around the Sohah - Im not totally positive why but somehow its an optimistic and humanistic story- some how it manages to deeply touch the soul without becoming a very depressing story. thank you for writing and producing it. I plan to watch the CD version and quarter to eight later this weekend, but i just felt a need to write to you to share with you my thoughts after reading the text in bed this morning.